Having settled in the big city we felt the need to get out of this concrete jungle and see and sense some nature, especially as we have experienced a few days of the seasonal haze (caused by massive land and forest fires started by farmers and plantation owners clearing tracts of land for plantings in Sumatra and Borneo). 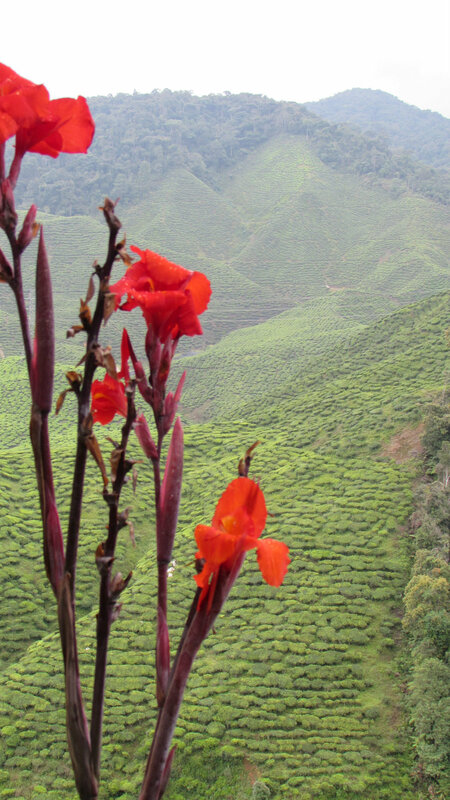 The Cameron Highlands, a mere three hours comfortable drive (mostly on three lane highways) north, provided this fresh and crispy air on 1000 – 1700 meter high jungle clad mountains. Here are the hill stations established by the British late 19th century. Along the winding mountainous road local farmers sold banana’s, jack fruits, durians, papaya, mango’s, star fruits, pineapples and rambutans just to name a few fruits. We stayed in kampong Kuala Terla, a 200 family farmers village settled mainly by Chinese. ‘How are you doing, where are you from?’ we were greeted by the extremely friendly locals strolling through the narrow alleys formed by wooden and concrete two storey houses seemingly randomly build close to the tea plantations and farm lands cladding the steep slopes. Breakfast was a roti canai (flatbread with curry) with warm water in a roadside restaurant (we paid 40 cents!). A visit to the BOH tea plantation reminded us of the tea plantations in Kerala, India and Golden Triangle, Thailand. Did you know? Fresh tea leafs do not smell like tea. They only get their typical aroma during the fermentation process. In the weekend we hiked up Hutan Lipur Gunung Datuk mountain, 90 minutes drive south of the city. Francien and I joined 30 fellow InterNations members, all working professionals from Pakistan, India, Malaysia, UK, Germany, Singapore, Nigeria, Egypt, USA, Bahrain, Norway and Denmark, between 35 and 60 years of age. It was a strenuous 2200 meters hike, steep up 800 meters climb through dense forest on a trail which was a mere washed away red coloured mud trench cluttered with massive tree roots. The forest was too thick to see any wildlife apart from the occasional butterfly. We heard monkeys whooping in a distance. On top of the mountain we rested on three free standing bolders from where we had a view across the lowlands. Back at the car park we waited for the last guys to finish their descent before heading home; a nice work-out, lots of fresh air and a great way to meet people. Another trip we made was to Malacca, a laid back colonial port city two hours drive south of Kuala Lumpur. 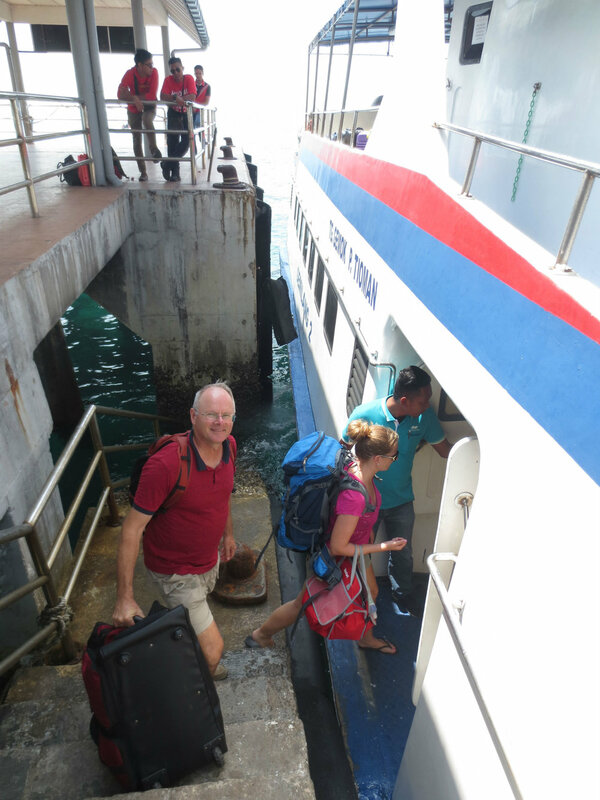 It had been high on our list of places to visit due to its Dutch colonial heritage. Walking down ‘Harmony’ street, worshippers prayed in the first Chinese temple (1645) in Malaysia, we visit one of the oldest functioning Hindu temples (1781) and we watch an imam leading the prayers in one of the first mosques in Malaysia (1748), all built right next to each other. In front of a street café Chinese people burned paper on the street celebrating ‘Hungry Ghost Festival’ while inside a headscarf clad Malaysian singer performed the latest Western songs. Multi-Cultural can exist! St. Pauls Church gravestones written in the Old Dutch language tell stories about harsh living conditions during those days. A floor plaque commemorated that the wife of Jan van Riebeeck (who established the Cape colony in the 17th century) died there reminded us of our own visit to the Dutch Castle in Cape Town in 1983. In 2001 we also saw Cape Cross on the Namibian Skeleton coast where Diego Cão landed in 1482 in an attempt to sail to the East: Francien and I have factually traced back the old spice route between Europe and Indonesia! The five hour drive to Tanjung Gemok on the east coast passes through tropical rainforests only interrupted by miles of palm oil trees flourishing in the mist-swathed lowlands. (Malaysia is one of the biggest palm oil producers in the world) There are no natural open meadows, but instead we see some cleared hills, deforested to plant even more palm oil trees. In the villages people seem to live in simple, but nice houses, many still built on stilts, but increasingly new developments are built out of concrete structures. Traffic signs warn for tapirs and elephants when crossing through the Endau-Rompin National Park, but we did not see any. The ferry (or rather a closed up speedboat seating 150 passengers on small chairs) does not follow an exact schedule, but depends on the tide and where the passengers need to go. After a choppy two hours ride (55 km) on the South China Sea (plastic bags where provided for those who had to empty their stomach prematurely) we arrived at Kampong Genting, where the resort boat picked us up for the last 15 minutes along rugged rainforest covered shore. Tunamaya Beach resort lies beneath the ‘two dragon’ peaks at a secluded coral beach. It has all the ingredients to be one of those perfect tropical paradises: crystal clear deep blue water, lonely white beaches, coconut trees on the beach and lots of sunshine! It is a laid back relaxing-in-the-sun-and-sea resort. However, despite the afternoon heat, Francien and I did climb up the mountain through dense tropical rainforest. There was absolute silence and we did not see any wildlife. I guess the undergrowth is so thick that even when you stand next to some animal, you would not see it anyway! The only monkeys we saw were inside the open air beach restaurant, snatching food from our buffet! Although our room was clean and comfortable and the personnel very polite and friendly, the service did not meet the star rating this resort received. The staff did not take much initiatives to accommodate the guests and any of our requests we had to follow-up a few times before someone would take care. The food was agreeable, but as so often in Malaysia, they ran out stock of standard items on the menu! Traveling by car in this country is fairly easy. However, many asphalt roads need a new surface to spare the suspension of the car. Finding your way when signboards are nowhere to be seen and your GPS signal is gone can be challenging. As long as you plan enough time, things will work out. Back in KL the haze is getting worse (today’s Air Pollution Index is ‘moderate’) and will only clear up when the monsoon rains arrive in October.